Stiefvater's lyrical language and ability to give immense detail without getting boring, is a beautiful thing. I can almost smell the beach and feel the sand between my toes as she describes the setting for Thisby. I wish that more time was spent on the actual races, but understand why she had to build up the world to make us care about Sean and Puck. Its a perfect book to read in preparation for fall! This has made my longing for the final installment so much stronger! This is the book club choice for September for my library's book group. It's not something that would normally appeal to me, but I did enjoy it. A nice sweet read that ended on a high note. 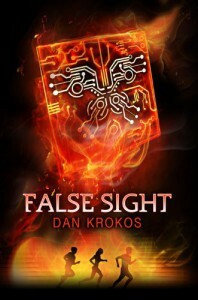 Dan Kroko’s False Memory was an amazing and unique read last year, so False Sight had quite a lot to live up to. For the sequel, Krokos takes a sharp left turn and completely changes the writing style for this second book in the series. Krokos spends a majority of the novel really diving into the mythos of his world and the motivations behind the characters. Instead of the uncertainty and non-stop action that readers grew to expect in the first novel, this one was more of a slow build that lined up the chess pieces for the thrilling conclusion in the series. A major plus for False Sight is that the readers are already familiar with Miranda and her friends. False Memory gave readers a chance to root for Miranda and help her on her journey to discover who she is and her capabilities. Krokos spends time in this novel developing Miranda’s relationships and her growth in character. He then picks up the speed quite unexpectedly with intensely detailed action scenes, and even a few flesh eating monsters thrown in the mix. I really loved the changes that Krokos made for this installment in the series. As a reader, I can tell that he knows and cares about his characters. It makes me want to read more and anticipate their actions. Triologies seem to be the new “thing” in YA, and while I can understand why, as a reader it makes me squirm and want to know how it all ends! Grounded is a thrilling novel set in the Amish countryside and following protagonist Lydia Troyer. However, don’t let that trick you into thinking this is calm light read. Lydia is not like the other girls in her Amish village. When she was just a baby, she was found in dumpster, electrical currents running wild and a strange figure telling her “father” to take her in and keep her safe. For a backstory, in 2050 Operation Source Code has infected “volunteers” with a virus to help stabilize the energy crisis. As the way many sci-fi novels go, there are disastrous results. Lydia is connected to these dark experiments. Lydia is forced to leave her Amish village to help her father, after a stroke,and once around energy for the first time, her life takes on a whole new meaning. No longer able to hide from the "Greens", Lydia is forced to confront who she is and who she wants to be. This is a highly detailed and very well written debut novel. I was sucked in by the prologue and didn’t let go until the very last page. I could do without love triangles, but that is just a personal preference. 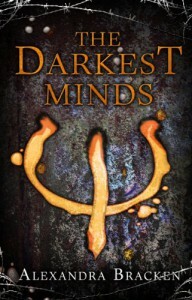 I found that the novel was a bit of a mix of Darkest Minds and Origin, which were high on my list last year. Overall, I enjoyed the story and will probably continue on with the sequel. Dot Hutchison gives reader’s an enthralling new look at the classic Hamlet with an invigorating twist in her new novel A Wounded Name. Told this time throw the eyes of Ophelia, Hutchison is able to captivate the reader’s with a different view of the madness of Hamlet, or in the case of this novel, Dane. Ophelia always knew she was different. She could see ghosts, interact with the supernatural, and never quite fit in at Elsinore Academy. After the Headmaster’s untimely death, Ophelia is sucked into the life of his grieving son Dane, and his mad plan to avenge his father’s death. Seeing Dane through Ophelia’s eyes opens the reader up to his quite prominent flaws and struggle to grasp onto sanity. The reader knows how this story is going to end, and Hutchison makes it clear where it is going, but there is still that desire to change the ending and save Ophelia from her fate. I read this for my book club this month. It is completely out of the realm of what I tend to read, which was actually refreshing. There are quite a few shocking scenes, that made me flip the pages back and forth, but overall it was a good procedural type novel. I enjoyed her writing style, as it was easy to follow and not too deep, which is what I was looking for after the long summer. Soren is a boy with a dark secret and a desire to be accepted by his peers. He sets off on a journey to find and save Baldur the Beautiful, and find himself in the process.I loved this book! It was a great "road trip" type novel with Gods, Goddess, and teenage angst thrown in the mix. Tessa Gratton has a wonderful way with language and an insight into the life of a teenager. Even better than the first, and I didn't think that was possible. My heart is aching for me! Review to come closer to publication date. Maureen Johnson has a knack for writing deep characters that connect with the reader. Rory is a hilarious protagonist who never takes herself too serious. Even in times of great danger, Rory’s spunky personality brings light to the dark situations. I loved it even more than the original, which is rare for a second book in a series. The cliffhanger will have reader’s throwing their books against the wall and cursing Maureen Johnson for making them wait for the conclusion. The intense mind blowing sequel to Ultraviolet, takes place a few months after the stunning cliffhanger that left reader’s on the edge of their seats. Tori Beaugrand now has a story to tell, and it is vastly different than the style of Alison, whom readers fell in love with in the first novel. Tori is very matter-of-fact, who needs facts and numbers to makes sense of her world. At the beginning of the novel, Tori and her family have escaped their cushy perfect lives, for ones far less superior. Tori soon learns that she has attracted the attention of a man who wants to turn her into a lab rat. She must now team up with both new and old characters to defeat her enemies and finally be free. Fans of Alison and Sebastian will be happy to know that the characters do reappear sporadically throughout the novel. It is full of complete twists and turns, and nothing about this book is predictable. This series is one that I will be heavily promoting to our library patrons! 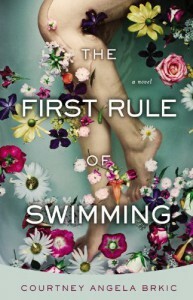 The First Rule of Swimming focuses on the relationship between sisters, Magdalena and Jadranka. Magdalena is close with her family and feels tied to their Croatian island home. Jadranka, on the other hand, has a wild spirit and flees from the restraints her home life has placed on her. When Jadranka goes missing for an extended time, Magdalena knows something is not right. Her sister never leaves for long. Magdalena leaves her island home and ventures out into the world her sister has embraced. The narrative effortless transitions from the present day, to the childhood of Magdalena and Jadranka. Secrets and unveiled and family life will be forever altered as Magdalena’s search goes on.This novel was a slow build but it leads to a very satisfying ending. The family dynamic was engaging and relatable to all sisters who have strong, but fractured relationships. I received this book from Netgalley. I think it is inevitable to compare this to the Hunger Games and Divergent with the similar dystopian concepts and "training" that goes into these type of events/games. It is almost like this book is a hybrid of the two. However, a big difference, at least in regards to the Hunger Games, is that the main character Cia wants to be chosen for the testing, and is honored to be one of the privileged few who get the chance to participate. 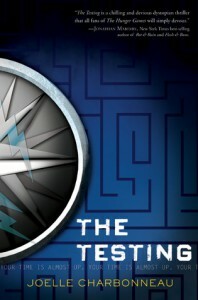 It is then, when she is in the midst of the testing, that Cia realizes that all is not as it appears to be. If you like both the Hunger Games and Divergent, and crave something similar, give this book a chance. If you want a new take on the current dystopian books, you might be disappointed. I did enjoy the book when I was reading it, but I also wanted more from the story.